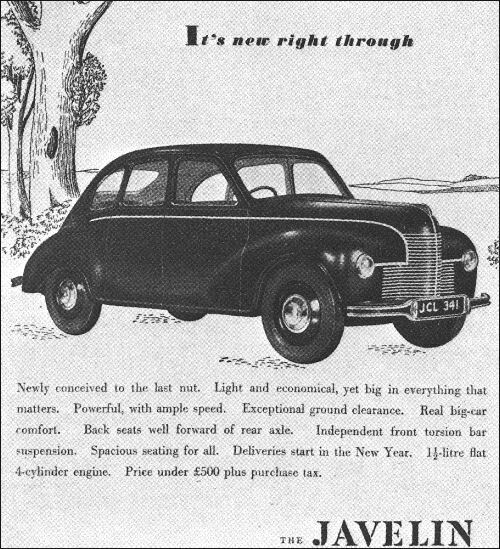 Jowett Javelin was first announced in mid-1946. It is an entirely new car, bristling with unusual design features. The horizontally-opposed four-cylinder water-cooled OHV engine is mounted ahead of the front wheel axis. It is of 1486-cc cubic capacity (72.5 x 90 mm) and with a CR of 7.25 :1 and two Zenith carburettors produce 50 bhp. Top speed is nearly 80 mph, fuel consumption averaging between 25-30 mpg. Drive is to the rear wheels via a steering column-controlled four-speed gearbox and divided propeller shaft. The Javelin has an A frame chassis, torsion bar ifs, longitudinal torsion bar rear suspension, and a flat four engine, mounted well forward with the radiator above it. Four speed box has column shift and steering is by quadrant and pinion. Brakes are hydro mechanical.